Ford was relatively late to the compact MPV marketplace, trailing rivals like the Renault Scenic to market by around six years when it introduced its Focus C-Max. Ford was relatively late to the compact MPV marketplace, trailing rivals like the Renault Scenic to market by around six years when it introduced its Focus C-Max in 2003. It might have been late, but it brought many of the qualities that were Ford’s signature at the time, so it was immediately praised for its fine driving dynamics, neat looks and good built. It wasn’t as cheap to buy as its rivals, nor did it offer the option of seven seats - as many rivals would. It’d take until 2010 when this first generation Focus C-Max was replaced by the C-Max and Grand C-Max before Ford would offer a seven-seater in the compact MPV class. The oldest C-Max might now be over 13 years old, but the Ford’s styling has endured, it still looking fresh today. Originally called the Focus C-Max, that name leaves no doubt as to what the C-Max is based on, though Ford dropped the Focus part of the title when the C-Max got its mid-life revisions in 2007. The styling revisions brought the C-Max in line with Ford’s family design, adding some shaper detail lines and new head- and taillights for a smarter overall look. The engine offering largely followed that of its Focus relation, with 1.6-, 1.8- and 2.0-litre petrol and diesel choices, in outputs ranging from 90hp up to 145hp. Given its practical nature it’s unsurprising that the 1.6 TDCi turbodiesel was by far the most popular choice its power being either 90- or 110hp. With its high (dashboard) mounted gearshift and slick shift the need for the optional automatic was marginal, and the C-Max is an enjoyable drive despite its earnest focus. That’s hardly surprising given the Focus underpinnings, Ford still achieving a fun drive despite the more upright driving position and higher body. That body afforded plenty of interior space, the cabin’s practicality being the key appeal for C-Max buyers. 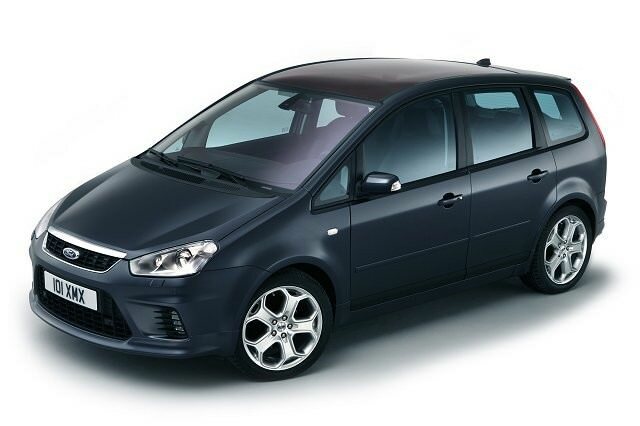 A big boot, lots of head- and legroom and useful cubby stowage make it an ideal family vehicle, though its many rivals like Opel’s Zafira, Citroen Grand C4 Picasso and Renault’s Grand Scenic can offer more seats if needed. Trim levels follow the Ford norm of the time, though you’ll be doing well to find any in the classifieds that aren’t Active models, with the occasional highest spec Titanium available if you want a bit more equipment. New buyers evidently liked the 1.6 TDCi 90hp turbodiesel in Active specification and we’re not about to argue with that. It's a good drive with decent economy - officially 4.8 litres/100km and 127g/km CO2 for a 2008 model year car. Ford might have been a bit late to the compact MPV marketplace, but its C-Max impressed, particularly if you want practicality but don’t want to sacrifice some fun while driving. No seven-seat option though, so if you’ve a bigger family you’ll need the larger S-Max or Galaxy, or one of the C-Max’s many rivals that offer a pair of pews in the boot. If you’re after a spacious family hatchback alternative though the C-Max is a useful thing indeed.